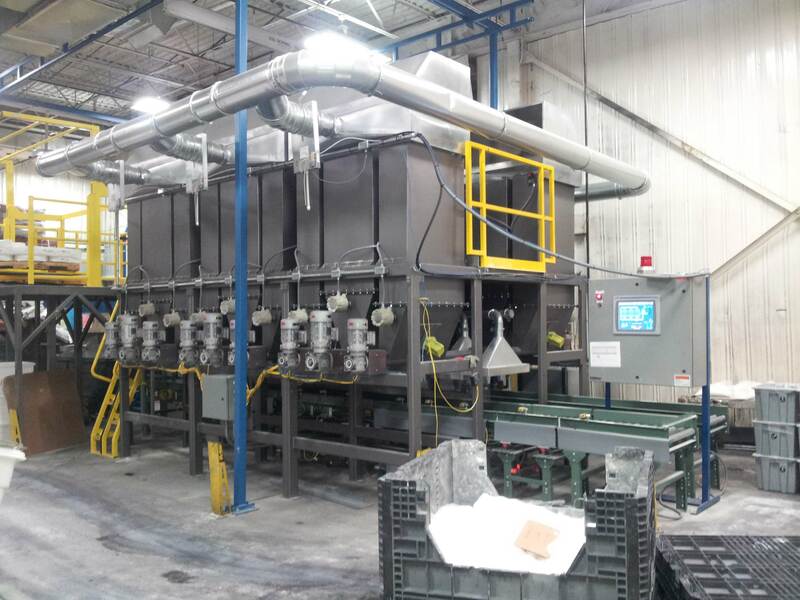 Sterling, IL May 2018: Sterling Systems & Controls, Inc. is pleased to announce availability of its customized automatic Material Weighing Systems. These systems (a.k.a. micro, minor and major ingredient weighing or batching systems) can include supply bins, feeders, work platforms, automatic or manual bin refilling, raw material bag handling equipment, dust collection/control, batched material conveying equipment (pneumatic and mechanical) or transport totes, lot tracking and traceability, barcode scanning, and RFID scanning. Other customized options can also be included. Micro weighing systems are those which have scale weighments up to around 50lbs (23kg). Larger weighments are known as Minor (50lbs up to 100-150lbs) and Major (> 150lbs). Often a combination of micro, minor and major weighments are included in customized material weighing systems. Sterling Systems & Controls offers a variety of feeding devices for use in the micro material weighing systems. Typically screw/auger and vibratory type feeders are used. The type used is based upon what the best solution will be for the specific application. The scale devices used in the material weighing systems can be of a variety of designs, including hoppers, platforms, conveyors, etc. The scale type chosen depends on application requirements, e.g. scale resolution, accuracy and batch rate. Transfer of the completed batches to downstream processing, such as a mixer, blender or other process equipment, can be done manually or automatically. Sterling Systems & Controls automatic micro material weighing systems are modular in design, allowing for expansion of the systems as requirements change over time. Systems typically range from 6 to 48 storage/supply bins, with the average being 24 micro ingredient supply bins. It is not unusual to update systems with additional bins after initial system installation. Electrical controls and automation for the material weighing systems can be provided. Sterling Systems & Controls custom designs each process control and automation system using standard state-of-the-art electrical and automation components, along with our decades of programming, process control and automation experience. Sterling Systems & Controls, Inc. has 40+ years of experience providing efficient solutions for process equipment, batching, micro, minor and bulk weighing, bag unloading systems, as well as plant automation. Sterling’s designs utilize the latest technology to provide specialized data management, raw material management, along with production data tracking. For more information contact Sterling Systems & Controls at 1-815-625-0852 sci@sterlingcontrols.com, and at www.sterlingcontrols.com.